Apostille your birth certificate in 3 easy steps. In order to apostille your birth certificate, you simply need to follow the 3 basic services as described below. You have the option of have us apostille your document only after the document is solicitor certified/notarised yourself, or alternatively you can also send us your original documents, we can take a copy, have it certified by a solicitor and go onto apostille it at the FCO office. We can offer a 2 day or same day service. For more information about Apostilling a Birth certificate, please read below where we have the most common questions answered. Section 1: Introduction – What is a Birth Certificate Apostille? Short Version: The short version of the birth certificate has the record of the newborn’s name, town of birth and date of birth. Long Version: The long version, in addition to the name, date of birth and town of birth, also includes details of the parents. An Apostille stamp is what legalises a document. So, when there is an Apostille stamp on a birth certificate issued in the UK, it will be recognised as a legal document in foreign countries as well. Although the Apostille can be attached to either version mentioned above, it is strongly recommended to get an Apostille stamp on the long version of birth certificate of the birth certificate from a reputed legislation service. A direct result of the 1961 Hague Convention Treaty, an Apostille Certificate is a confirmation that the birth certificate is genuine or real, so that it can be accepted when used in another country. Apart from birth certificates, an Apostille stamp is also used to establish the legal status of passports, government identification cards, marriage certificates, licenses and even educational degrees. 1.What does an Apostille Birth Certificate look like? An apostille on a birth certificate or any other document is the seal of authentication provided by a specially appointed government official. The apostille birth certificate in the UK is accepted by all signatory countries under the Hague Convention of 1961. Either format is acceptable for the signature of the local registrar or stamped by the government registry office. The legalisation of birth certificates in the UK is done by attaching a stamped official certificate, known as “Apostille,” to it. The UK birth certificate with Apostille will have the child’s full name, the father’s name, mother’s name, child’s date of birth, place of birth and the verified registration district. 2. Who can Apostille a Birth Certificate? In the UK, officials at the Foreign & Commonwealth Office can legalise documents by putting an Apostille stamp on birth certificates and other documents. There are many fast and reliable legalisation services in the UK, who offer Apostille for birth certificates. They offer professional Apostille services, notarisation services, FCO legalisation of all documents, ranging from birth to death certificates, deeds, wills, contracts, identities and more. They have a team that advises people on a wide range of document legalisation matters. 3. Why do you need to Apostille a Birth Certificate? When travelling outside the UK, people often need to prove their nationality. This can be achieved if their birth certificate is recognised overseas. This requires the birth certificate to have an Apostille attached, so that the relevant authorities accept your UK birth certificate. There are many people in the UK with dual nationality. For such individuals, legalising the UK birth certificates of their children becomes necessary. If a person intends to get married overseas, they may require an Apostille stamp on the birth certificateto prove that they were born in the UK. In case a relative has recently passed away and you are the nominee mentioned in their will with overseas assets or are helping in the process of will settlement, you’ll need the Apostille of the birth certificate for the legal process. 4. How do I get an Apostille stamp on my birth certificate? Getting an Apostille on a UK birth certificate is a simple process, when you use a reliable service. When issuing an Apostille stamp for UK birth certificates, the legislation service processes the original document or an official copy issued through the registry office records. This is because an Apostille birth certificate in the UK must include the original signature or official stamp of the registrar. You need to provide the original certificate and not a photocopy to the legislation service. You can post your original birth certificate for legalisation in the UK directly with our online order form. In case you do not want to send the original certificate for a legal seal, an official replacement document can be ordered by the legislation service, from the general registry office. This will, however, entail an administration fee. After checking the document, it will be legalised with the Apostille in just 1-2 days. The preferred payment method in most places that issue Apostilles is credit cards and bank transfers. You need to provide your banking information, along with all the paperwork. Also, you should provide your contact information, like mailing address, email and phone number, for correspondence and Apostilled document delivery. 5. How long does it take to Apostille a birth certificate? An Apostille on Birth Certificate is made available either as a same day or 2-day service. The fee will vary according to the service chosen. 6. Where can I get my Birth Certificate Apostilled? A birth certificate can be Apostilled by the Foreign & Commonwealth Office, which will confirm that the signature, stamp or seal is from a UK public official. 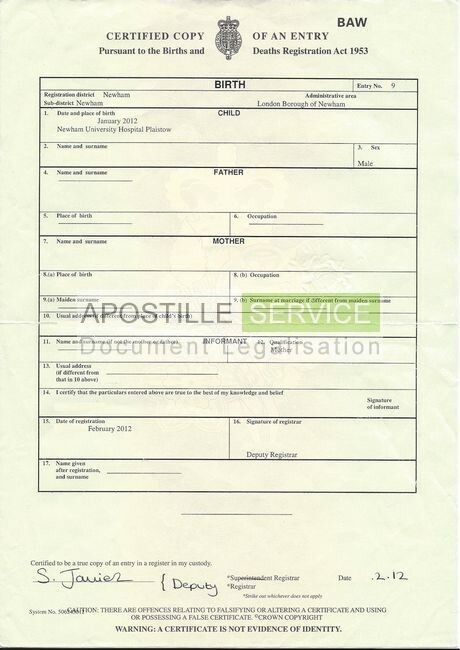 You can also hire a reputed legalisation service to Apostille UK birth certificates and for other legal services. 7. How much does it cost to Apostille a birth certificate? An Apostille birth certificate in the UK usually costs £78 if the two-day delivery service is chosen. This includes £30 as FCO fees and £8 VAT. Those interested in the same day service will need to usually pay about £135, which includes £75 as the FCO fees and £10 VAT. 8. Why should I use Rapid Legalisation Services to get my Birth Certificate Apostilled?